If you're looking to make a really big statement, something big enough to catch anybody's eye and is dramatic enough to be a stunning focal point for any space, we got one word for you: Wall Murals. From elegant, classy dining rooms to energetic, stylish kids' rooms, an endless variety of themed wall murals are available for all! The best part? These Wall Murals are made of an innovative canvas material with a peel & stick adhesive on the back for easy application! The Wallpaper murals do not wither on the walls, so they do not cause damage after removing and is a perfect choice for renters! If your old school and like a traditional method to install wallpaper, we got other cool water activated adhesive wallpaper that is cheaper than our signature peel & stick murals. We’ve rounded up 21 stunning wall mural ideas for your home that might spark your creativity to start your own wall mural project! These wallpaper murals fill up white walls better than furniture or wall art projects that seem difficult and time consuming. The jaw dropping features of some of these landscape wallpapers or city view wall murals adds depth, colour, and some amazing views. Check out Eazywallz Panoramic Wall Mural collection for some other great inspiration! Pictured above is the Panoramic View of Paris Wall Mural from Eazywallz. Cool maps is a great choice for a fun and educational look. These custom wallpaper photo is ideal for any age or any class room that will add something extraordinary to the walls. Pictured above is the cartoon animal map wall mural. Here's a cool look how Interior designer Dufner Heighes Inc used a cool geographical map for a children's bedroom on houzz. Vintage wall murals capture a moment in time that makes you feel like you are almost in a different world. Every photo captures a piece of time in that moment the photograph is taken. Take a trip back in time! Explore our selection of Vintage peel and stick wall murals and wallpaper murals to add a retro touch to your home decor. Let's go back to the good old days! Check out how designer AT6 Architecture used this Vintage Custom Wall Mural in the Gold Country Residence found on houzz. Traditional textures can add a cool vintage look to your walls. This look is a little less industrial and leans toward a more softer look. A white painted reclaimed wood can fit perfectly in a french country decor or use some of these wood wall murals to add a more authentic look to your cabin inspired home style. Here some cool ideas from Housely that have some wood looks. 5. Skyline Wall Murals from your favourite city! Cityscape Wall Murals are ideal for anyone looking to add something incredible to their walls. In addition to providing a stylish and trendy look, the depth of field of these wall murals creates an amazing illusion of space and will add a third dimension to your walls. They are also a perfect solution to open up rooms without windows. Alternative, trendy, and edgy, Urban Street art Wall murals is one of the most vibrant and exciting Wall Mural ideas for your bedroom, loft, or basement. It has some of the most amazing and innovative colour combinations you will ever see! For street art enthusiasts, these peel n' stick wall murals will look like the real thing without permanently damaging your walls! 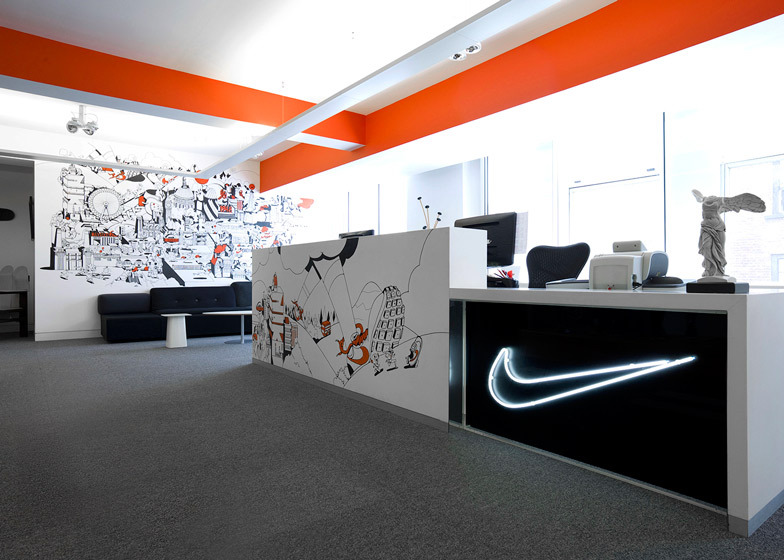 Below, Rosie Lee redesigned the Nike Hq in London with awesome street art wallpaper mural in the front entrance lobby. Combine an awesome wall design in different colours with rustic elements for a look that’s unique while remaining comfortable in your home! These Geometric Wallpaper Patterns can add colour and shapes to a accent wall. 8. Realistic Door Murals to Create a secret get away! The pathway door murals from eazywallz not only provides an illusion of depth but also creates a one-of-a-kind look that will keep you speechless! From sandy trails to secret pathways, there is a wide variety of paths to choose from depending on your style! 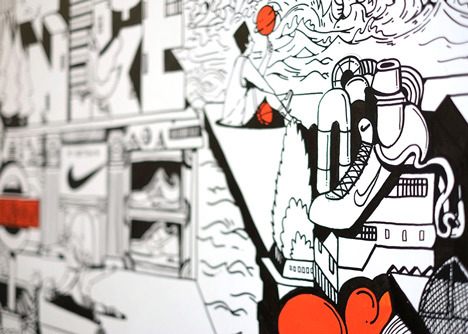 Check out our top pathways in our door mural collection! If you don't want to break the bank on gigantic pieces of wall art for your home there is alternative solutions. Using high quality oil painting wallpaper murals can be a nice alternative to gigantic framed art. Check out this cool daniel in the lion's den wall paper mural from eazywallz for a unique large scale wall mural look in any space. Designer Thomas Marquez also used a gigantic piece of vintage wallpaper art on houzz.com pictured below. If your looking for a custom job just head on over to the custom upload section to create something like this. With so many options to choose from there is no wrong choice for wall mural in a kid's room. Why not choosing a cartoon forest landscape? It provides colour, style, and a nice way to set a stage for your young ones to act and play! Apartment Therapy showcases a cool monkey jungle scene wallpaper mural in the picture below. 11. Best Alternative to exposed brick! Alone or in combination with other materials (wood, glass, etc) exposed brick just screams tradition and authenticity. This rich texture is probably the most popular texture for a reason. Using a removable wall mural of brick allows you to choose your very own accent wall! Check out a couple of other cool exposed brick ideas from the decoist. Cityline TV used eayzwallz havana brick wall mural for this tv segment. Check it out below. This retro wall mural with a futuristic taste fits perfectly with most of your decor. The illustrations are creative and fun and the mural could be placed perfectly in any restaurant, bedroom, office or store. Check out our 20 of the best wall murals in restaurants around the world article to see more amazing illustrated wall murals in action! Professional gyms have been installing murals for years to showcase ideal bodies and motivational quotes to push there clients when working out. Eazywallz recently did a professional custom wall decal job in Power Gym. You can customize your very own wallpaper here. Boston Virtual Imaging did an amazing golf wall mural in this room to create a one-of-a-kind realistic scene. Check out our golf wall murals to create a custom wall mural just like it! If you're looking for something with more detail and personal you can choose an awesome map wall mural. From vintage maps to custom coloured maps, we have it all. Check out customaps.com to create your very own personal map print or map wall mural for home! Thisiswhyimbroke.com showcases many cool map murals that you can buy online or customize your very own map wallpaper with eazywallz customizer. These cool textured wall murals is gaining popularity for accent walls in many homes. The realistic effect gives a retro feel while adding some cool colours. This look is really versatile and could be put up in a teen's bedroom, a sports room, a man cave, or any bedroom. Check out our Torn Poster Wall Mural Collection here. There is something about larger than life dreamy forest wall mural photos placed in your bedroom that just makes your mind wonder. On top of that, when these amazing Wall murals are of wildlife, lakes, and just the clean outdoors, it brings you closer to nature. With so many different kinds of forests and landscapes to choose from you can match with any bedroom decor style. You don't have to climb mount everest to see the top of some of these beautiful mountains. These landscape wall murals will provide a sense of calmness on your walls and will match with any home decor piece with its desaturated colours. The contemporist uses a mountain mural to get a cool effect here. 18. Surfs up with cool Wave and Surfing wall murals! Waves are a perfect choice to show the powerful ocean in your home. With so many different options to choose from you will surely find the right style and colour for your home decor. You can incorporate a custom wave wall mural into most colour schemes in your home. Below, you can see this teenager's bedroom is a perfect fit for this surfing fanatic. You can customize the size and colour of all eazywallz wave and surfing wall murals. Pictured below is an aweomse wave wall mural in this bedroom by Jodie Cooper Design on Houzz. The blue tones and ravishing waves fits perfect with the rest of the decor! Stuck in your home during the winter cold months? or can't enjoy a vacation with your busy schedule? Try installing an awesome beach or tropical get away wall mural to lose yourself in an amazing scene. Choose from all over the world! from the Thailand waterfall wall mural to a beach in the Caribbean wall murals. There are so many beach and tropical wallpaper ideas on pinterest from all over the world. Check them out! If you are looking for something larger than life to put on your walls then look up and imagine the vast outer space on your walls. A good choice for kids, the space wall murals can span over any area and provide good depth to open up any room. Pictured below is an awesome wall and ceiling wall mural designed by KaDi element on houzz. Another amazing idea for a kid's room or any bedroom that needs depth is a cool sky and clouds wall mural. These light wallpaper murals can provide a bright look in any room! Pictured below is an awesome boardroom custom sky and clouds wall mural from eazywallz. Check out more awesome boardroom design ideas in our article 6 Wall Mural Ideas for a Better Boardroom. Liked any ideas above? Contact us now for more information regarding custom wall mural orders or wallpaper ideas. Our in house graphic design team can create mostly anything you can imagine so don't be shy! We hope you liked our 21 stunning Wall Mural Ideas and don't forget to check out our instagram or pinterest boards for added wallpaper ideas for any room!